During the last two years (with the support of the DSLRF Grant Award 2007), we have mainly focused our attention on both 1) the involvement of oxidative stress in breast microenvironment and 2) the function of adhesion molecules in the breast cells of the ductal-lobular unit. 1) Starting from our previous evidence that active lipid peroxidation may have a physiologic role in the normal mammary gland and that lower levels of isoprostanes in NAF of BC patients suggest altered arachidonate metabolism (Mannello et al, Int J Cancer 2007;120:1971–6), we have recently discovered that in NAF Phospholipase A2-IIa activity (key enzyme regulating arachidonate metabolism) may play a dual role in breast microenvironment during cancer development and progression. 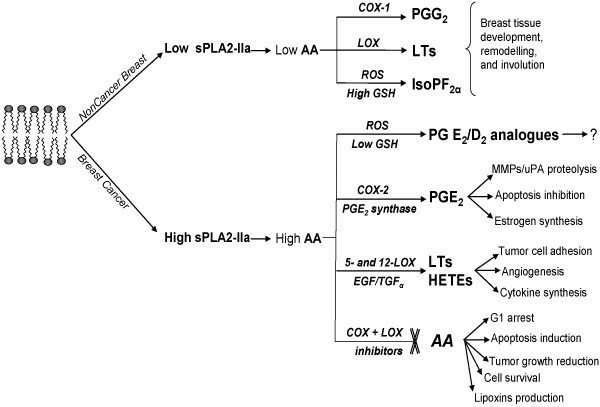 It shows a beneficial role releasing low Arachidonate levels in physiologic status, while its up-regulation has detrimental functions allowing the conversion of high arachidonate levels into leukotrienes and prostaglandins, promoting BC progression. Noteworthy, the inhibition of this pathway through COX-inhibitors leads to induction of apoptosis and tumor growth reduction (Figure 1). 2) Based on our hypothesis that peculiar junctional complexes may differently seal breast ductal cells leading them to different evolution (Mannello et al, Breast Cancer Res Treat 2007;102:125), we have recently discovered that higher levels of soluble form of P-cadherin were found in NAF from cancer patients. We found a positive correlation of sP-cad with disease stages and tumor grade, and an inverse relationship with estrogen/progesterone receptor status. High levels of sP-cad in cancer NAF suggest its release via proteolytic processing, favouring cancer cell detachment from breast duct. 4) We overviewed how Diet nutrients may regulate in breast microenvironment both NAF protein expression and cancer etiology. We also reviewed how the Intraductal approaches assessing metabolic changes in breast microenvironment may help to identify early breast cancer biomarkers in NAF. Finally, we critically overviewed and discussed how the Protein analyses of NAF (mirroring the breast microenvironment) may differentiate healthy women from breast cancer patients.